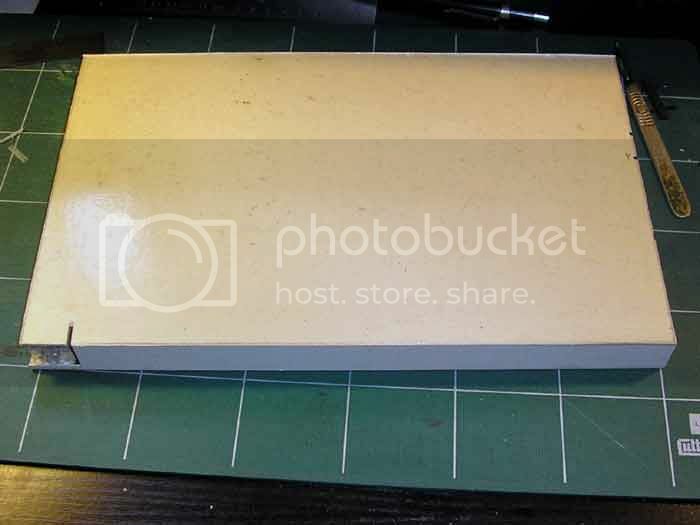 MODERATOR'S ANNOUNCEMENT After the Great P Bucket Disaster lots of photos have been lost, we have been able retrieve some but these are now at the end (currently Page 21) of this thread as it's impractical to replace each photo in its ideal spot in the thread. I like the concept of doing this thread as a beginner Steve. Although I am not a beginner I am new to the larger scale and have learned that some things that work fine in smaller scales don't translate well to larger projects. I have already learned a few cool new techniques for working in larger scales such as your techniques for doing the rust on castings...very cool! I think you can get a pass on the soldering iron though...I owned one long before I started Model railroading! Unless it's the building at the desk part that prohibits the use of it. Looking forward to following along here. This should be interesting. There are a few "simple" questions I'm been meaning to ask and I meen very simple. For example, how do you print off the "factory" to the right size in the first place and then how do you stick it down with no flaws!? Also I can't find "my" factory! Hate computers. Hopefully these simple things will be covered in your tutorial. I will be covering sticking the printout to card, the method I use anyway, so i wont go into that now. As for the printing, if it is not coming out the right size, it will be in the print parameters that something is not set right. I presume you are using Adobe Acrobat, in which case click the "file" button, then scroll down the menu to "print" which opens the print control panel. On the left you will see the sub section titled "page handling". Ensure the "page scaling" is set to "none" and just below that "Auto-Rotate and Centre" is ticked and that "Choose Page Source by PDFpage size" is not ticked. It should print out correctly using these settings, hopefully. If you are on a Mac, then this will probably be no help at all . Looking forward to seeing this progress Steve. It will make an interesting comparison with 'Ambasador Works', which is being built to a similar set of restrictions, although in my case I'm trying to use as much recycled material as possible, whether genuine 'saved from the bin' stuff or just re-used from aborted projects. As you say, with something this size, if it goes wrong you haven't lost too much other than time, and no doubt gained experience in the process. There are many prototypes with simpler track-plans. I think micro layout is an appropriate and already well known term. Nick Ellingworth wrote: I think micro layout is an appropriate and already well known term. OK, time to get the show on the road . Unfortunately, this first section is going to cover the way I made the base that I'm using, which is just one of many ways of doing it, so may not be relevant to some. If I hadnt set my own constraints here, of building it all at the desk or kitchen table, I would most likely have gone for MDF, or possibly ply. As it is, I decided to go for expanded polystyrene sheet and card, both of which are easily worked with a knife and straight edge. The method does build into a very strong and rigid base though, so there might be info usable for other projects. So, lets get started. The methods used here are extremely easy to construct and use a sandwich of ¾"/18mm expanded polystyrene sheet, between 2mm card/mountboard. 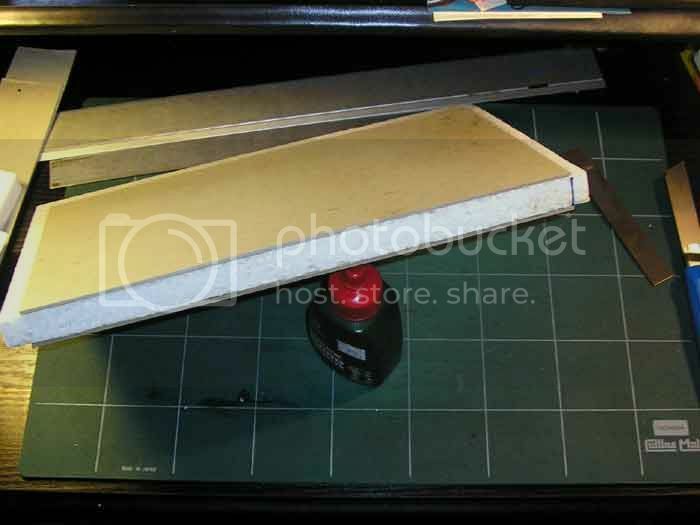 If you can cut a straight line, measure fairly accurately and measure a right angle, this will pose no problems. First pic shows the materials. The card has already been cut to size, which is 12"/305mm by 7½/192mm, with hindsight, it might have been easier to use A4 paper size, but why make life easy . At this stage, the polystyrene has not been cut to size, more on that later. The first step is to glue the card to each side of the polystyrene. If possible, use one manufactured edge of the polystyrene as a reference for keeping everything square, if this is one of the longer edges, so much the better. To glue together, I use a woodworking PVA glue, but more like a contact adhesive. First apply glue to one side of the polystyrene and spread it out over the whole surface, so that it is a very thin layer. Then do the same with one sheet of card. An ideal spreader is something like an old credit card or a piece of thin styrene. The next pic (3) shows the spreading in progress, aim for a very thin layer, which will give an almost instant bond. Just visable at the bottom of the pic, is the polystyrene sheet with the sheen of the glue showing. Then repeat the process to apply the second sheet of card to the other side of the polystyrene. Aim to get both sheets of card aligned on both sides, this will give a much squarer base to work with. 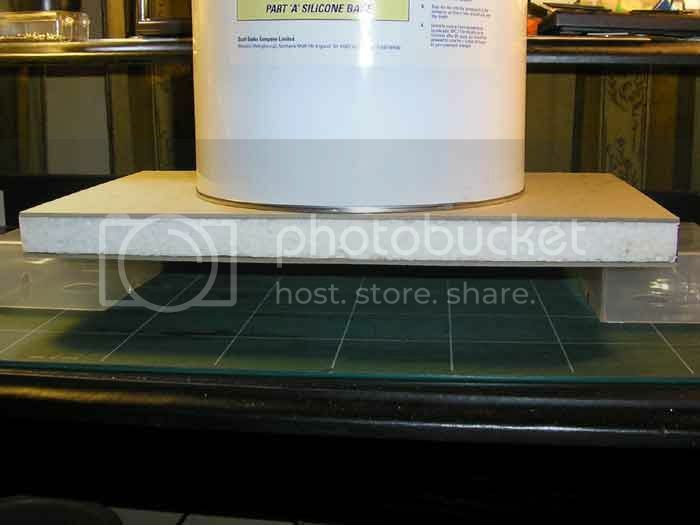 Once both sides are stuck on and lined up as accurately as possible, place it on a flat surface, with a few books on top, for about an hour for the glue to set. At this stage, go and have a meal/shower , or as I did, start making the cassette to feed the layout . I will cover the cassette in a later section, so lets pretend the hour has gone by. The next step is to trim the polystyrene in the middle of the sandwich to size. The best tool I have found for this, is a knife with snap-off blades. By extending the blade out, you get a nice long cutting edge. 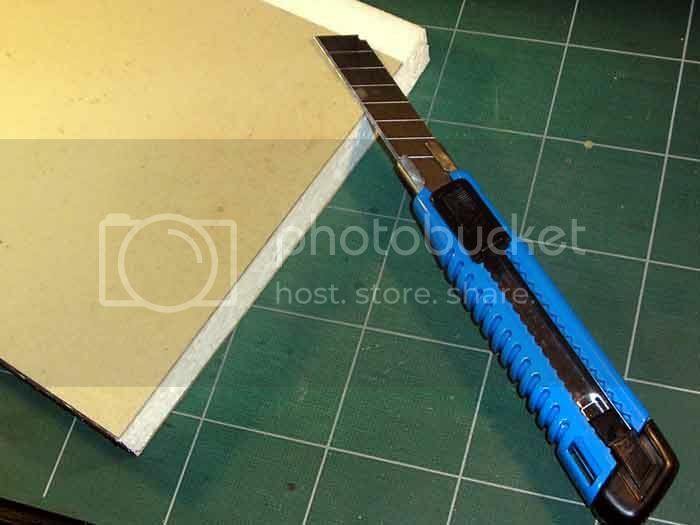 Using the card as a guide for the blade (pic 8 ), simply cut through the polystyrene, a slight sawing motion helps. This is a lot easier to do than describe. 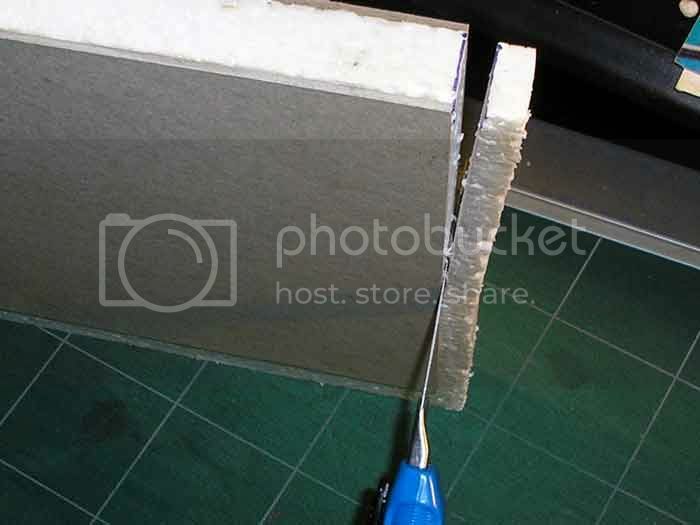 Cutting this way should give a very clean cut to the edges and be perfectly to size, pic 9 below shows how clean an edge it produces and there are very few beads of polystyrene detach themselves from the sheet. Just to illustrate how rigid a base this produces, pic 10 below shows it supported at each end and with a 5kg tin of RTV sat on top of it, there is no flex in it at all. I guess you could call it heavy duty foamcore, which weighs practically nothing. The limiting factor as far as size is concerned, is the size of card you can get, one day I will build a bigger layout with this stuff. To finish off the base and protect the foam inner, an edging of 1mm thick card, is applied next (pic 11). A simple strip of card, in this case 22mm wide, is glued to each edge, again using the thin layers of glue, to work like an impact adhesive. It is worth reading the next stage after the pic first though. It was only while putting this together that I decided to have the connectors for the power supply incorporated into the base, lack of forward planning here but easy to remedy. Looking at the layout from the front, the cassette will connect to the left end, so the power is going to be fed into the layout at the opposite end, so the rear right was chosen to locate the power lead. 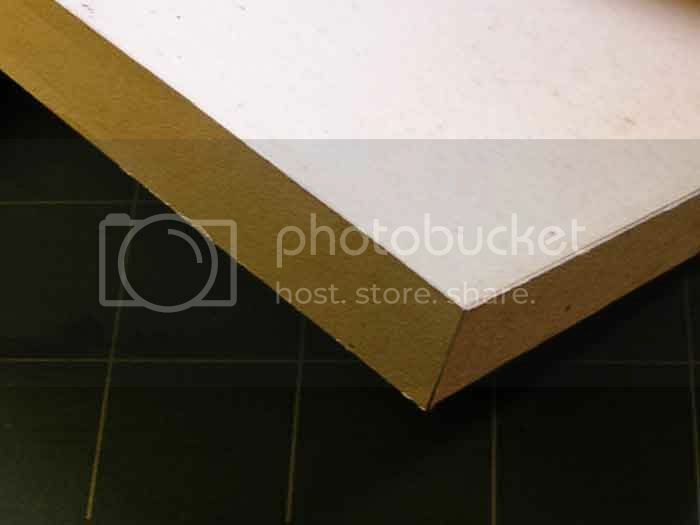 A cutout, slightly larger than the screw connector block being used was made in the corner, the cutout was also lined with card to maintain rigidity. Hopefully the pic will show it better than i can describe. The observant will also note that I messed up, I initially put a cutout for the wiring on the bottom face rather than the top . One final pic (13) to show the completed board from the rear, the location for the power supply at the left. You might also notice a slight sheen on the top surface. 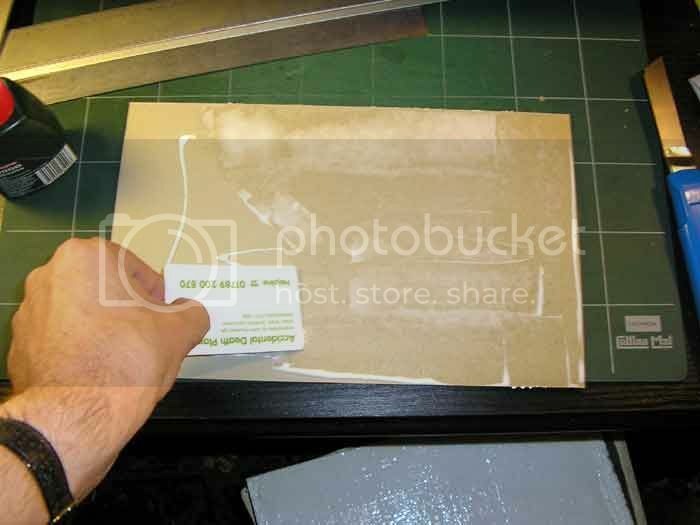 This is a very thin layer of glue applied all over the top to seal the card. This together with paint, will hopefully prevent too much water being absorbed by the card during later scenic work. Well that concludes the base construction. The next part will be track laying and wiring. Last edited by Steve Bennett on Sun Aug 16, 2009 1:58 pm, edited 2 times in total. Very, very interesting Steve, I take it the polystyrene is the sort found in packaging for 'build it youself' furniture from the likes of Argos etc? As you say, the size of materials is the biggest limiting factor - you can get card up to A2 (I think) in craft shops, so the question really should be how big a sheet of polystyrene can you get your hands on? 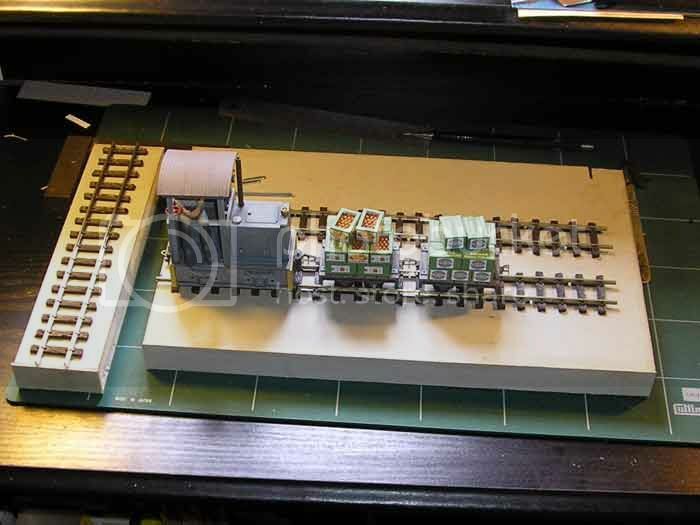 The only drawback I could see is if you needed to do any complicated wiring, turnout frog polarity, or just complicated layouts, is hiding all the wiring without having to run it all over the baseboard top, although a trackbed layer of foamcore or card might do the trick. Colin Peake wrote: ...so the question really should be how big a sheet of polystyrene can you get your hands on? B&Q sell huuuuge sheets of the stuff (insulation) for about £10 for an 8' x 4'. It depends on thickness though, obviously the thicker the more expensive. 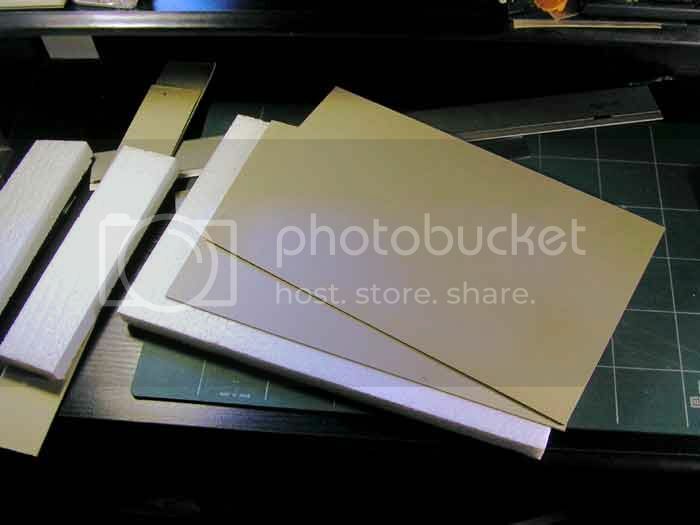 Excellent post Steve, that's a really nice method for producing a light and strong baseboard for a layout of this type. Yes, the piece of polystyrene I used was some that was used as packaging and as George stated, it can be bought in 8' by 4' and 8' by 2' sheets as insulation material. I think B&Q only stock a limited range, somewhere like Wickes tend to have more selection, though I have not bought any for a few years. The card will probably be the limiting factor with size, I dont know how butting 2 pieces together would work, may be ok if joints are staggered, but not tried it. 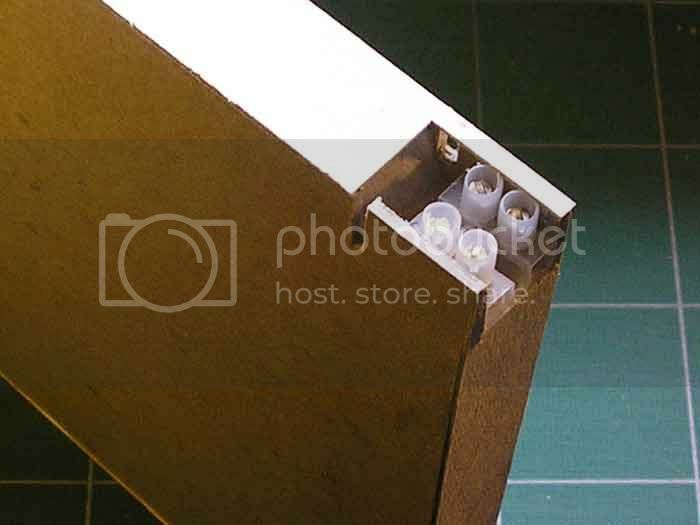 Another option is 2mm MDF, this should prove even stronger, as would a thin ply. Plenty of scope for experimenting. Last edited by Steve Bennett on Fri Aug 29, 2008 1:26 am, edited 1 time in total. That's a good point, Steve, the B&Q I was thinking of is a "B&Q Warehouse", whilst the normal "Superstores" don't sell the insulation. Interesting construction method Steve I might just try it myself eventually if I finish the other layouts in progress. By the way Mountboard is easily available from any framing shop and usually within a few days. Largest regular size is Double Imperial at 44"x32". There is however another slightly larger size called "Large Format" which I had to use for backdrop of the Fizz-Bang Tram layout. Size is 47"x32". When I ordered the black I required it was available the following afternoon from a local framers. Nice one Steve.It must feel strange to go back to square one. I'm watching this with interest. Very interesting - on the way to the garage/store to see what is lying around. Think thats about it for the next stage. (now what the heck is PVA ?